Quad tree is an interesting data structure. It is used for solving various geometrical problems, such as fast collision detection, indexing of geospacial data, etc. I am going to show how it might be used for approximation of different 2D shapes. (There is also 3D version of quad trees, called octal tree). 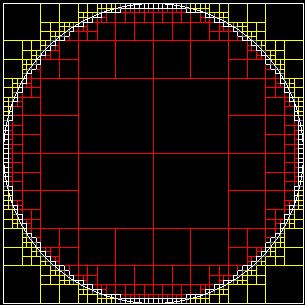 Small white rectangles approximate circle’s border. Red rectangles form an inner area of the circle. Yellow does not belong to the circle and might be removed. This procedure might be recursively applied to all leafs in the tree until new leaf rectangles reach certain size. r – is the radius of the circle. There is a C# solution that shows this basic algorithm: Download. By modifying function f, one can adopt this algorithm for other 2D figures.